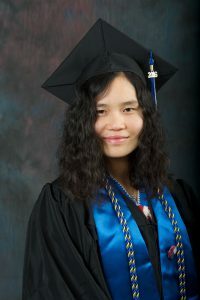 ST. PAUL, Minn. (May 10, 2016) — A Burma native and one of a select few Karens to graduate from college has been chosen an outstanding student at Metropolitan State University. Naw Dah Bu was selected spring semester outstanding student in the university’s School of Urban Education. She was one of 876 students receiving bachelor’s, master’s and doctorate degrees at Metropolitan State’s 98th commencement exercises on May 2 in Saint Paul. Dah Bu was a toddler when she and her family were uprooted from their rural home in Burma by the military, which commonly looted and burned villages and enslaved and killed villagers. Dah Bu spent 16 years in two Thailand refugee camps before arriving with her family in the United States in 2004. She serves as a part-time social service translator for Twin Cities-area Karens. Dah Bu, who student-taught at Hmong College Prep Academy in Saint Paul, previously was a Karen teaching assistant at the academy. In the past several years, Dah Bu has participated in Karen singing competitions. Last year, she won second place in a Karen Anglican Young People Association event in Illinois. Dah Bu plans to teach in an urban setting and then perhaps pursue a master’s degree. Given the right circumstances, she eventually hopes to return to Burma to teach. Metropolitan State University, a member of the Minnesota State Colleges and Universities system, is the Twin Cities public, urban, comprehensive state university providing lifelong learning, and competitive academic and professional degree programs at the bachelor’s, master’s and doctoral levels.